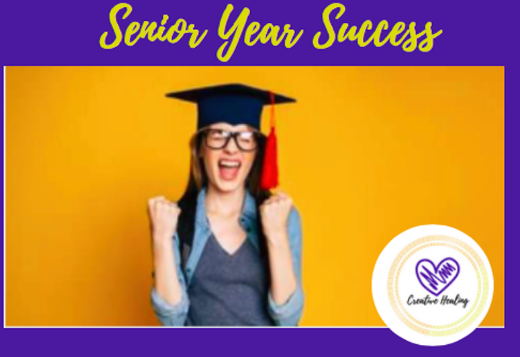 Ready for your high school senior to move from feeling overwhelmed and uncertain about the college application process to feeling SURE and SECURE with the roadmap for college-bound success? ✔️How you can complete the Common app, FAFSA and piled up paperwork while maintaining your sanity AND a solid relationship with your teen in the process! Having anxiety is normal and necessary. It's what motivates us to get work done. It's what keeps us safe from dangerous situations. Well, then anxiety has done its job and we're happy. The truth is that avoidance "works" to manage anxiety. And that's what makes it so hard to change. When we avoid a situation that makes us anxious, it makes the anxiety go away. And that makes us feel safe. But it also maintains the anxiety. Avoidant behavior confirms in our brains that the trigger for our anxiety actually IS a threat. And then it makes it even HARDER to face this situation in the future. At the teen support center, we help teens learn that the only way to anxiety relief is THROUGH the anxiety itself. We teach targeted coping skills to manage in-the-moment anxiety while also helping our teens to FACE the situation that's making them anxious. As our amazing therapist Gabby Morale always says, "If you can't face it, you can't fix it... so let's face it together!" Many students are SO focused on the NEXT steps, like college and career that they create stress, anxiety and overwhelm in the moment that makes it difficult to enjoy time with friends, downtime at home and family fun too. What's more... this becomes a HABIT. Constantly looking at what comes next. Perpetually wondering, "Do I measure up?" Dissatisfied with life and lacking joy. Feeling like everything is SO hard because they are always focused on what they NEED to be and accomplish, rather than accepting and loving who they are right now while taking action steps to meet goals. We teach our teen clients to use coping skills and mindfulness as a means to balance accepting life right now so they can actually enjoy it AND setting goals for future success. This helps teens to learn how to regulate emotions and manage worry thoughts so that they don't take over and make life miserable. When you're constantly focused on what you don't have, anxiety spirals into panic. We know that change is impossible without acceptance, so let's help your teen learn to accept themselves AND learn to laugh this school year. This is the LAST week to apply for a space in the Senior Year Strong 12-week group series. Did you know that 90% of poor treatment outcomes in therapy are related to assessment errors? This means that MOST times, what your teen may be working on in therapy is focused on a goal or behavior that's not actually the root of the problem. The "problem" is actually most times the solution! When your teen engages in a behavior that you see as problematic, such as self-injury, school avoidance, arguments or risk-taking behaviors, most times, this behavior is the result of a prompting event that has triggered strong emotions for your teen. Their "problem" behavior is actually the solution for your teen in the context of their life, their resources, the skills they currently possess and the habits and behaviors they have learned over time in their environment. The problem is actually the prompting event and high emotions that come with that cue. Unhealthy behaviors aren't the problem, they're a SKILLS DEFICIT. First, we help your teen envision a life worth living and partner with them to build a commitment towards their goals that's so strong that unhealthy behaviors become incompatible with their lives and begin to fade away. We help our teens articulate what they WANT out of life... not just what they don't want, so that they can spend their time moving towards goals and enjoying the moment, rather than trying to escape or avoid difficulties. Next, we help your teen identify what behaviors are getting in the way of their goals occuring and help them learn new behaviors that give them the same outcome (and at the same intensity) as the unhealhty beahviors that were providing them relief. We're not just spending 45 minutes venting or talking about problems, we're supporting a structured process of behavioral change that will help your teen learn to act skillfully no matter what life throws their way. What happened BEFORE the problem behavior occurred? Was anything else happening this week that caused them to be more emotionally vulnerable, like less sleep, more schoolwork or illness? What did I do as a parent to respond to my teen's problem behavior? Did my response make the behavior better or worse? What was the ultimate OUTCOME for my teen of engaging in this problem behavior? Did they find short-term relief, escape or avoidance? How can I help my teen achieve the positive outcome they desire (and at the same intensity) while helping them phase out unhealthy behaviors? Help your teen act skillfully! Groups have been proven to be the best way to help our teens learn new skills because it allows them to practice in a controlled environment and get real time feedback too! Complete an interest form here if you'd like your teen to be considered for a space in group. Feel like a failure and say negative things about themselves or to themselves if they get a poor grade on a test or something doesn't work out in a social situation. They may shut down and start to think, "What's the point? Why should I bother? I'm not even going to try anymore." Or the other end of that spectrum is they may overcompensate and work themselves to the bone, stay up until midnight completing work, never feel like it's good enough and continue to be super hard on themselves as a means to try and motivate themselves to perfection, which we know is not a possibility. Most of the time parents and professionals will try to increase or to boost self-esteem. But, boosting self-esteem is just a temporary fix. It's like putting a band-aid on a wound that doesn’t heal. Most professionals will help your teen track their negative self-talk. They'll help them learn to tune in to what they're saying to themselves, and then learn some thought replacement techniques to try and change those negative or critical thoughts with more positive or helpful ones. They'll help them learn to be their own cheerleader. BUT, for teens especially this feels FAKE, and we all know that teens have that BS-meter, where they can notice something that feels fake immediately! This leads to discouragement, because it's not a quick fix and it doesn't work right away. Who wants to replace the same thought over and over and over again, right? Thought replacement is just a temporary fix! If I said to you right now, "Try your best to not think about a pink elephant." You'd have to think about that pink elephant before you tried to not think about that pink elephant. It's the same thing with thought replacement, when we're talking about negative to positive self-talk, you still have to think about and feel the negative thought before you can replace it with a positive one, so that feels discouraging for our teens. What's more is that when they have that thought and then they have to go through the action of replacing it, it inadvertently reinforces this idea that there's something wrong with them for having that thought to begin with because they are aware that they have to change it, and that further increases feelings of low self-esteem. Here's the solution to low self-esteem: let's foster self-compassion instead of self-esteem. Now, this is a little bit different than thought replacement. For example: if you got a B on a test you might say something to yourself like, "Oh my gosh, I'm such a failure, I can't believe I didn't get an A. I can't believe I didn't study more." You'd start to verbally beat yourself up a little bit. But if your friend got a B on a test, you might say something like, "A B is a pretty good grade. I know you wanted an A, but a B is acceptable, and you can try harder for the next one." So why is it that we can talk to our friends in a way that's compassionate and kind, but when we don't measure up to our own expectations, it leads us into this spiral of shame and negative self-talk? It’s time to treat yourself with kindness and think, "How would I talk to a friend? And how can I learn to talk to myself in the same way?" To doubt and question yourself is human. Accept it! Self-doubt and self-criticism are a totally normal part of being human. The goal for any of us isn't to get rid of these thoughts, but to recognize them without letting them define us. This is why groups can be so helpful, especially for our teens, because groups help them to recognize that they're not alone in thinking and experiencing what they're going through, and that there's nothing wrong with them for having these feelings. It's a really beautiful thing when one of my teens can share an experience that they're having, and another teen, at least one, in the group can say, "Yes, I get that, I understand that, I feel you." They understand each other in a way that makes them feel like they're not weird, bad, wrong, or different for having self-doubt, for criticizing themselves, for feeling down on themselves, for being frustrated. Normalizing these NORMAL feelings as part of a human experience is so, so important when we're talking about being self-compassionate, because it means that there's nothing wrong with you, it means that you're not broken, that you don't need fixing, that it's all about acknowledging these thoughts without getting attached to them or without letting them define us. Getting a B on a test doesn't mean that you're a failure. Failing a test doesn't mean that you're a failure. It means that you didn't do as well as you wanted to, and there's a way to improve on that, but it's not defining you as a failure as a person. The research says that having an accurate self-perception has been proven to be way more effective than having high self-esteem. Part of this is because when we focus on self-esteem as a metric and then we have an “off” day, we automatically believe that there's something wrong with us. It hinders our ability to have an accurate sense of self because we're always basing it on some kind of external validation or some experience that we're having in our lives. The other end of that spectrum is that when we typically rely on validation or doing well to boost our self-esteem and then we don't excel at one of those tasks, it shakes the very foundation of our identity and who we are. For teens, when their developmental task is figuring out who they are, this can become really dangerous, and it can lead to changes in mood and urges and behaviors that become concerning for us as parents and professionals. Help your teen connect, cope, create and foster self-compassion! I'd love to invite you to connect with us. We're enrolling now for our Connect, Cope and Create Summer Camp, that is a week of groups and activities that are designed to help your teen go from overwhelmed, stressed, and unhappy with themselves, to learning to cope with life's ups and downs, learning how to tune in to how they think and feel, and how to be in control of their feelings, rather than let the feelings control them and define who they are. We all know that we can't change or make feelings go away, but we can learn to cope with them and create a life that's worth living and that your teen loves, fully engages in, and is effective for them so that they can learn to be kind to themselves and finally treat themselves like their own best friend.